Writer Matt Kindt has many talents; his vision for a series, mastery of the creative process, and exponential beard growth, to name only a few. 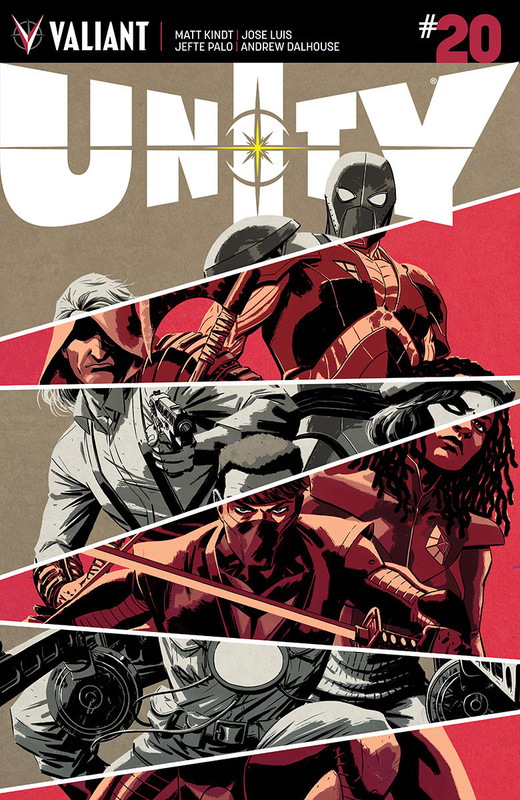 Kindt has written 100% of Unity to date, so it is safe to say that not only does he “know” the characters, but further that he “knows” their future and how everything in-between fits together. Kindt also writes the ongoing Ninjak series (both a fan favorite and popular) starring a key-member of the title which further solidifies his grasp of all-angles Unity. It is no spoiler or small secret that the story of Unity #19 and #20 revolve around a new character known as the War Monger (simply read the cover of #19 and it says as much). Honestly, the character is fairly interesting whose background and story expands the known history of the Valiant Universe (certainly enough for future stories that may be someday written). The tone and style of War Monger might fit better on the pages of Ivar, Timewalker or (we can only hope…) Archer & Armstrong as the character is written quite comically, while also being a credible and menacing threat. How exactly Toyo Harada or the Bleeding Monk have allowed her to continue to exist is beyond reasonable logic, but this is a review and not continuity wish-fulfillment. Compared side-by-side, Unity #20 is a better issue than Unity #19, improving on the previous issue on a number of levels. Reading Unity #19 it was easy for many readers to say to themselves “Huh….? Wait, what just happened and why…?” whereas Unity #20 flows a bit smoother, while keeping the characters involved, well, acting like they actually are supposed to – unlike they did in issue #19. For proof and/or supporting evidence for this obviously opinionated statement, read Ninjak #1-#4, then re-read Unity #19 to come to your own conclusion about how Ninjak was used. Some debate, however, has existed on social media and on various forums about the interior page art penciled, inked, and colored by the team of Jose Luis, Sandro Ribeiro, Alisson Rodrigues, Jefte Palo (with colorists Andrew Dalhouse and Ulises Arreola). It appears that Unity #19 and #20 may very well have had too many “chef’s in the kitchen” (artistically) and spoiled the broth (or artistic presentation in this case). Both issues #19 and #20 occur in different time periods; the past and the present. Artwork for pages set in the “past” are quite detailed and of a quality that works well with the 18 issues (and #0…) that came before. The arguable issues come with artwork for pages set in the “present” which appear almost cartoonish with far less detail and quality. The transition is quite jarring, and detracts from the overall experience. Some might disagree, but a spade is a spade; for a title called Unity , we needed more “unity” with how the artwork comes together in #20 (as well as #19). A potential solution could be to use one artist, or at least two that compliment each other’s styles. This title is solid enough to demand as much.